A major “clean” coal project that was once viewed as a keystone for cleaning up the Midwest’s greenhouse gas emissions appears near collapse. Wednesday, a spokesman for the Indiana Gasification project — which envisioned the capture and storage of carbon dioxide from a coal-to-gas facility in Rockport, Indiana — said the initiative was suspended and “likely dead” after passage of a bill in the state Legislature last weekend. The $2.8 billion project’s suspension also stalls a first-of-its-kind CO2 pipeline from Denbury Resources that was considered a potential emissions game changer because it would have provided a link for additional, emissions-heavy Midwestern projects to carry captured carbon dioxide to enhanced oil recovery operations in the Gulf Coast. Indiana Gasification, a subsidiary of Leucadia Corp., planned to carry captured carbon dioxide through the Midwest-Gulf Coast line, which Denbury explored in 2009 via a feasibility study, but had not yet built. The CO2 pipeline “is not looking like a viable project at this point,” Denbury Resources spokesman Ernesto Alegria said Wednesday. The Indiana Gasification plant was the last remaining potential source of carbon dioxide for the proposed pipeline, Alegria said, and without it, there simply is no incentive to move forward with the greenhouse gas conduit. “You have to have enough CO2 to make a project,” he said. The Rockport plant, which had not broken ground, would have captured roughly 5.5 million tons of carbon dioxide annually from the process of gasifying coal into synthetic gas. Under a 30-year-contract, the Indiana Finance Authority planned to purchase the substitute natural gas at a set rate, estimated by analysts to be around $6.60 per million British thermal units. The state would have then sold the substitute gas for a profit or loss, depending on market prices. Indiana Gasification LLC spokesman Mike Murphy said that the state bill, passed early Saturday morning, set new standards that would have added two years of delays and made financing impossible. The bill would allow the Indiana Utility Regulatory Commission to review the project’s financing contract. The only way the coal-to-gas plant will be revived is if the state Supreme Court takes up the matter, and that is not guaranteed, he said. The court also would have to rule completely in Indiana Gasification’s favor for it to make a difference, he said. Last year, an Indiana appeals court reversed portions of the financing contract (ClimateWire, Nov. 1, 2012). “If the Supreme Court does not take the case, the project is dead. The legislature and the governor knew this when they put the language in the law just passed,” said Mark Lubbers, Indiana Gasification project manager, in a statement to ClimateWire. 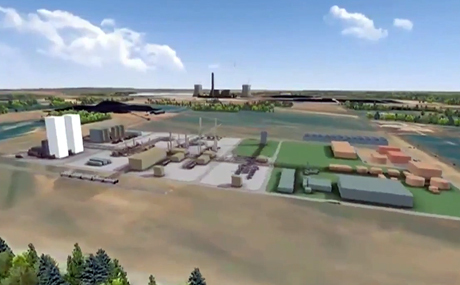 The project is the latest carbon capture proposal to face severe challenges amid low natural gas prices, changing politics and declining funding options. While several similar plants are still moving forward, many others have been canceled amid spiraling costs and the lack of additional financing. Many experts believe that carbon capture technology will never get going at a wide scale unless there is a price on carbon or much stricter greenhouse gas rules on power plants. The Indiana plant was pushed heavily by ex-Indiana Gov. Mitch Daniels (R) four years ago at a time when the shale gas boom was not as well-established and carbon fees were on the table nationally. “This was Mitch Daniels’ baby,” said Kerwin Olson, executive director of the environmental advocacy group Citizens Action Coalition, in a recent interview. Incoming Gov. Mike Pence (R) was not a similar champion of the idea of gasifying coal into synthetic natural gas, telling the Evansville Courier & Press last month that the project needed re-evaluation. The project also faced strong opposition from Vectren Corp. and environmentalists, who said synthetic natural gas is not a cheap or smart idea with flush supplies of shale gas available. The wellhead price of natural gas fell from about $8 per thousand cubic feet to $2.66 in 2012, according to the Department of Energy. “Energy prices have dropped substantially, and what looked like it had real potential when the price of gas was so much higher — now you have to bring into question whether it makes sense,” said Indiana Senate President Pro Tempore David Long, according to an editorial in the Courier & Press. The opposition from gas utility Vectren and environmentalists all played into the changing politics. The Sierra Club and other activists — who dubbed the plant “the Leucadia tax” — sent more than 6,000 emails and calls into the offices of state lawmakers before the vote. The project’s supporters said that the plant would have provided financial stability for a state that currently imports its gas. They noted that the Indiana Utility Regulatory Commission originally considered the future trajectory of natural gas prices and approved the project to avoid price volatility. Supporters of carbon capture generally note that the technology is the only way to control emissions from coal, which is expected to remain a global player for decades. In multiple newspaper editorials in the past year, Lubbers said opponents were distorting the state framework for the plant. Yesterday, he also charged that state legislators were issuing a “false promise” by signaling that the state Supreme Court could revive the project. “The judgment of the state is very clear: Neither the legislature nor the governor support the contract or the project. The institutions that provide the capital to build a plant of this size will not do business in a state that is so cavalier about the $20-plus million dollars we have already invested,” Lubbers said.